Yorkshire's Adil Rashid trudges off, one of 20 wickets to fall on the opening day of the County Championship match at North Marine Road, Scarborough against Durham (Picture: Tony Johnson). GLENN MAXWELL and Adil Rashid today recorded the highest sixth-wicket partnership in the history of first-class cricket at Scarborough. Maxwell and Rashid tore up the record books with a sixth wicket stand of 248 in 46 overs. It beat the previous best sixth-wicket stand at North Marine Road of 201 by Phil Mead and George Thompson for Players against Gentlemen in 1911. 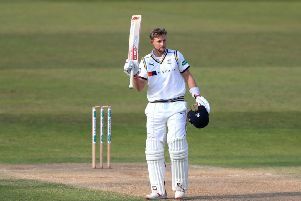 It also eclipsed the previous best for that wicket by a Yorkshire duo, the 159 by Jonny Bairstow and Anthony McGrath against Leicestershire in 2012. After 25 wickets had fallen in the first four sessions of this match, Maxwell and Rashid batted throughout the fifth against an increasingly dispirited visiting attack. Maxwell reached the tea interval on 135, made from 132 balls with 17 fours and two sixes, while Rashid has 102, made from 127 deliveries with 19 fours. By the time Ryan Pringle had Maxwell caught by Graham Clark running in from the cover boundary, he had sprinted on to 140 off 145 deliveries with three additional fours. Rashid reached 127 when he was out in similar fashion, this time hitting Chris Rushworth - operating with the new ball - to Clark at deep cover. Yorkshire were in some trouble when they came together 20 minutes before lunch with the total 79-5 in the 27th over. But they have played in positive and aggressive style, scoring at a rate of 5.9 runs per over and utterly transforming the complexion of the contest. Durham were guilty of bowling too short after lunch, with John Hastings particularly culpable, and the Yorkshire pair took full advantage in the sunny conditions before a crowd of 4,100 at North Marine Road. Maxwell was first to fifty, made from 62 balls with six fours, while Rashid got to that landmark from 70 balls with 10 fours. Having taken his 400th first-class wicket in the Durham first innings, Rashid also passed 5,500 first-class runs at the venue where he made his debut as an 18-year-old in 2006. Maxwell got to three figures from 101 balls with 14 fours and two sixes, achieving the milestone in the grand manner when he lofted leg-spinner Scott Borthwick for six over long-on into the Peasholm Park end. It was remarkable batting by the duo, with Yorkshire scoring 211 runs in the session in 38 overs. Tim Bresnan and Liam Plunkett added to Durham’s woes by making it into the 20s before Steven Patterson and Ryan Sidebottom saw it through to the close when Yorkshire were 420 for nine and leading by 426.